A lot of things eat baby birds, and alligators eat most of those things. Birds in the Everglades seem to have noticed this, and nest in trees near alligators. The alligators provide a benefit to the birds, keeping away the opossums and raccoons that would eat their eggs. But what might the alligators get out of it? Researchers at the University of Georgia in Athens have been doing a grisly study, inspired by the fact that a large amount of bird colonies in the Everglades have their own pet alligator hanging around underneath. The benefits to the birds are obvious. Their nests are well out of alligator range, but with the gator lurking beneath them, they are less likely to be raided by any of the snakes or rodents that might creep into their nests and eat their eggs or young chicks. It occurred to the researchers that the alligators might not be stationing themselves under the nests by coincidence. After studying both colony-affiliated and non-colony-affiliated alligators, they found that the ones that lived beneath bird colonies were much more well-fed. Their findings are published in the journal PLOS ONE. 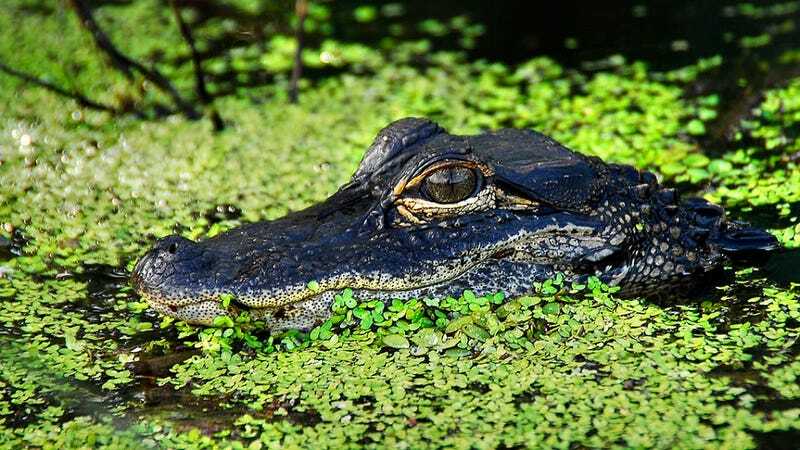 The researchers briefly snatched up the alligators, measured their length and weight, and took blood samples which allowed them to measure the nutrients in the alligator’s systems. The divergence was remarkable. A six-and-a-half foot alligator that lived under a bird colony was likely to be 6.6 pounds heavier than one that did not live near a bird colony. The alligators aren’t big-hearted guardians who want to keep chicks safe. They’re hanging out near a good food source. Some of that food probably comes from clumsy would-be predators who try for a nest and end up in the water. Some of it comes indirectly from the bird guano, which increases the nutrient content in the water and attracts algae, small shrimp, and eventually fish. However, a substantial part of that 6.6 added pounds is rejected chicks. Many bird species lay “extra” eggs. If a chick dies, out it goes over the side of the nest. If a chick is unlucky enough to be the smallest, the last one hatched, or to be hatched in a year when the birds’ food supply dips, its parents will push it over the side alive. Colonies can involve dozens of nests, and if each nest rejects only one or two chicks, the alligator still gets a steady rain of food. This is not a conscious arrangement between the birds and alligators, but it does seem to be a satisfactory one for everyone but the rejected chicks. And if you’re in the Florida Everglades, or other swamps, and see a beautiful colony of birds nesting in the trees above you, be careful where you step. There’s likely to be an alligator on patrol.